Would you like a little bit of submarine with your waiting? Never has nothing happening been such compelling viewing. In autumn 1941, World War II U-Boat 96, crewed by young rowdy Germans, puts to sea with its veteran captain, wildly Teutonic Jürgen Prochnow, his eyes the color of eagle and high cheekbones set on stun. The battle for control of the Atlantic is turning against the Germans, yet Hitler orders more and more U-boats with ever younger crews into battle against the British freighters and their destroyer escorts. This opening pitch and the antsiness of Jürgen’s young hooligan crew seems to presage a roaring Hitlercoaster of war war war Amerikan style – but director/co-writer Wolfgang Petersen and writers Lothar G. Buchheim and Dean Riesner swerve to port with a counter intuitive yet singularly entertaining and tension-filled, character-driven non-action action movie. These young punks discover that being at war is much like the waiting room in any doctor’s office. DAS BOOT is filled with periods of waiting in fear, waiting in boredom, waiting in terror, waiting in anxiety – and sudden action that rips throats and bends steel with its bare hands. DAS BOOT does something which most commercial war films are too gutless to do – humanizes Germans: they carry photos of their girls, they write home, there are heroes and cowards, there are hard men and those that crack under the strain; they catch crabs and rib each other about it; at one point, a sailor stops a celebration with the announcement of bad news on the radio – into the silence, he declares that back home, their soccer team has lost! These men doubt much of the war propaganda they are fed. 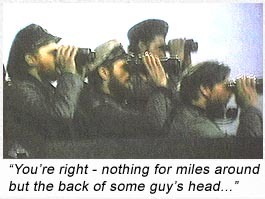 Even though German tacticians convey Churchill as a “paralyzed guzzler” the officers on U-96 respect the British fleet (“Those aren’t amateurs up there”). Yet they do not fear the British simply because that is the default position of Germans in Westernized film, but because the British had better equipment. These Germans are not one-dimensional haters, not committed blindly to the Führer, not simple villain props as in countless Brit and U.S. movies. They are the heroes. And our hearts are with theirs in their throats every watery step of the way. Even in its shortest version, DAS BOOT is 2 hours, 29 minutes. The Director’s Cut is 209 minutes, the uncut version is 293 minutes (4 hrs, 53 mins). It’s the most fun you’ll have growing a five o’clock shadow. 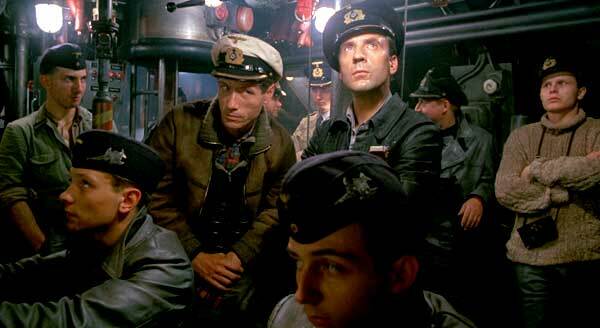 DAS BOOT attains such a high level of drama, we forgive Wolfgang Petersen for the subpar exteriors, with those model subs and little dolls on the tower being foamed in slow motion to emulate a sizable u-boat. When most movies are ending – at the 1:33 mark – this movie sees its first action. Yet even the action is not what one expects: after U-96 fires torpedoes at a British convoy, they submerge and wait in silence, listening for the muffled far-off explosions and counting the British ships sinking by the groans of steel they hear through the depths. And they know they’re in for repercussions – depth charges. The waiting begins anew – the interminable, unbearable waiting for death to claim you or not – as they “run silent,” all lights out, submerging further, engines at minimum. The sound of sonar pings their only warning that something is closing on them from above. The Captain says into the silence, “Here it comes. The revenge.” And all they can do is hang on through the bucking explosions and bolts bursting on pressurized pipes. After the terror subsides, Prochnow simply declares, “That’s the end of that.” Not heroes. Not cowards. Just doing their job. Don’t pity him: his office is just like yours – dank, miserable and underwater. When U-96 surfaces to survey their kills, they are outraged to find that one of the flaming ships they torpedoed still has men onboard, jumping off, screaming, aflame. And the focus of the Captain’s outrage will surprise you: “Why weren’t they rescued after all these hours?” One of his officers begins to weep for the dying. It’s a wondrous portrayal of war empathy, of humanity. It makes us question war yet again, and question the supposed intelligence of the species that can create the marvel of submarines and battleships only to use them in such unproductive, moronic fashion against each other. Imagine the frustration of knowing that on a submarine, humans are the least important cargo – literally stacks of torpedoes, spare parts, tools for repairs (it’s like being in space – there is nowhere you can turn if you need a certain part), food, fuel, ballast, the mechanics of the sub itself, and at the very bottom of the list – as evidenced by the way sleeping bunks are haphazardly squeezed into crawlspaces – people. 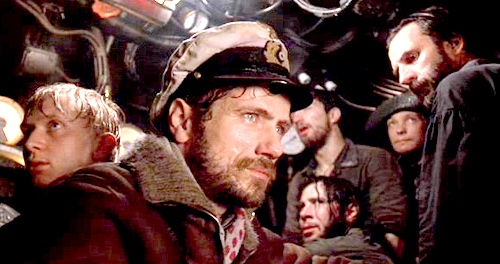 DAS BOOT is a gritty study in patience, tactics, anxiety, tolerance, futility, and brings a whole new meaning to wetting the bed. aka: THE BOAT, U-BOAT 96.
aka: DAS BOOT: THE DIRECTOR’S CUT. Writer: Lothar G. Buchheim, Wolfgang Petersen, Dean Riesner. Starring: Jürgen Prochnow, Herbert Grönemeyer, Klaus Wennemann, Hubertus Bengsch, Martin Semmelrogge, Bernd Tauber, Erwin Leder, Martin May, Heinz Hoenig, Uwe Ochsenknecht, Claude-Oliver Rudolph, Jan Fedder, Ralf Richter. I visited a submarine once, in San Francisco Bay, right across from Alcatraz Island. 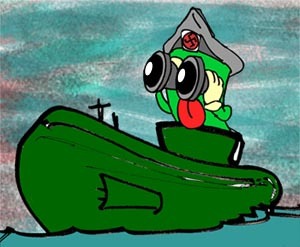 Besides marveling at how snugly my little green body would fit into the torpedo tubes, I was horrified at the living conditions that submariners had to endure – one thing that is never shown or mentioned in submarine movies is how the firing of torpedoes involves flooding the torpedo bays first, to equalize pressure on the hull – the torpedo bays which, for want of space, include bunk beds and living areas of some of the sailors! Yes, after the flooding and draining, meaning after battle stations has passed, the sailors have to find a way to dry their bunks first before cozying into a good night’s sleep, or whatever kind of fitful doze they can muster surrounded by humming frigid steel and the threat of being woken at any time of their sunless, emaciated existence to flood their beds again and fire more torpedoes. U-Boat = Unterseeboot (undersea boat, submarine).